And here's my 'A Very Wonderful Place' altered wood panel that I created with the contents of my travel bag. I've a few step out photos on how I created it, hope you will enjoy seeing them. 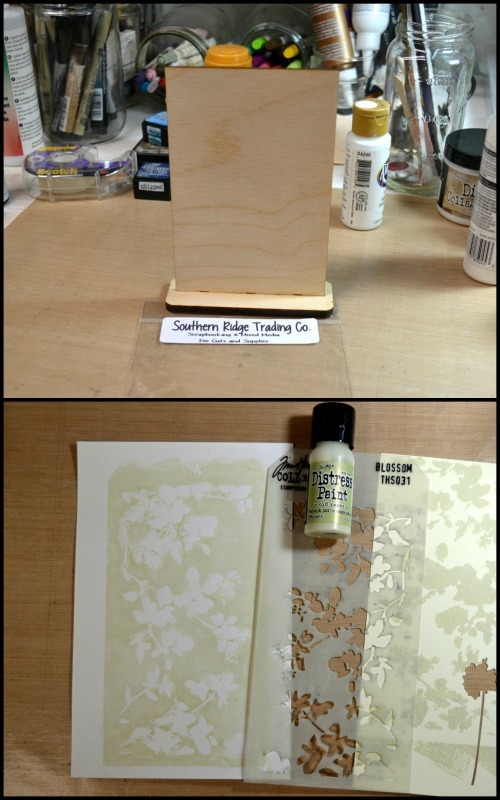 I unfortunately didn't have any MDF in my stash so I substituted this free standing wood canvas from Southern Ridge Trading Company for the MDF surface, necessity is the mother of invention! For my background, I used the stencil monoprint technique on 110 lb white cardstock through Tim Holtz's Blossom stencil with Old Paper Distress paint. 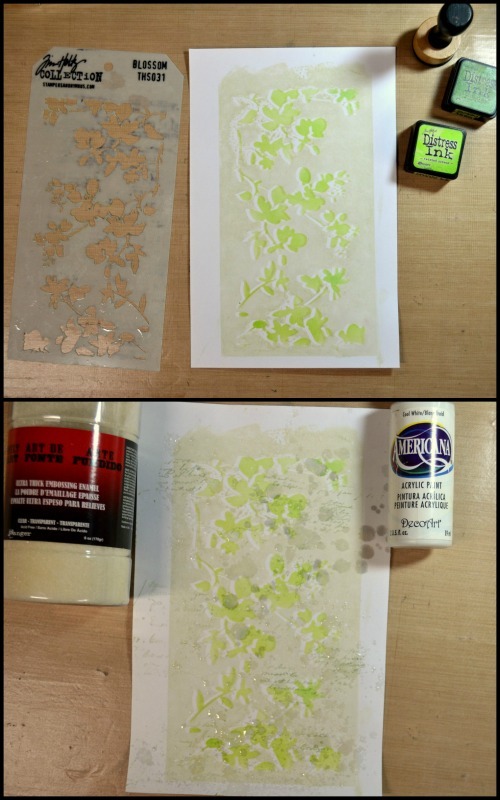 I then reapplied the stencil to the monoprint, bumping it slightly so it wasn't lined up exactly, and inked through the stencil with Twisted Citron and a touch of Mowed Lawn Distress inks. A bit of stamping with a script stamp and Leaf Green Archival ink came next and then I sprinkled the background with water, applied some clear UTEE and heated the embossing powder from the back to activate it. I unfortunately used a bit too much water to hold the UTEE in place in spots and ended up with some translucent areas once the powder melted but decided to embrace imperfection and just went with it! Spattering with diluted white acrylic paint completed my background panel. Wildflowers were die cut from Distress Mixed Media Heavystock, overstamped with the same script stamp used on the background and Hickory Smoke Archival ink, and then watercoloured with several shades of Distress inks (Spun Sugar, Picked Raspberry, Shaded Lilac, Dusty Concord, Twisted Citron and Mowed Lawn). I've become rather enamoured of watercolouring Wildflowers with Distress inks lately! The prepared background was trimmed and adhered to the free standing wood panel and the watercoloured Wildflowers afixed overtop. A few of the wildflowers were bumped up slightly on tiny pieces of white fun foam. A Quote Chip was adhered to the top right corner and some green Distress ink coloured cheesecloth was glued all around the base. One of Tim's Salvaged Dolls was aged with Vintage Distress Collage medium and her dress was painted with Americana Green Tea acrylic paint. Diluted Ground Espresso Distress Crayon was painted on to emphasize her features and colour her hair slightly. The crown and star wand from the Treasures Adornments were coloured with Silver Mixative and then aged with Black Soot Distress crayon. A teeny little flower from my stash was coloured with Spun Sugar Distress marker and adhered to the star wand and a couple of fussy cut butterfly wings were adhered to her back. 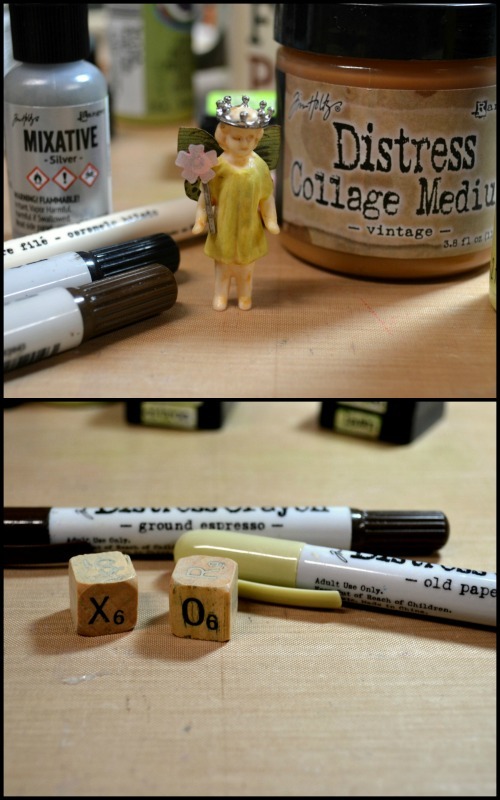 An 'x' and an 'o' Alpha Dice were coloured with Old Paper and Ground Espresso Distress crayons. Mini Holiday Greens were die cut from cardstock coloured with Twisted Citron and Mowed Lawn Distress inks. 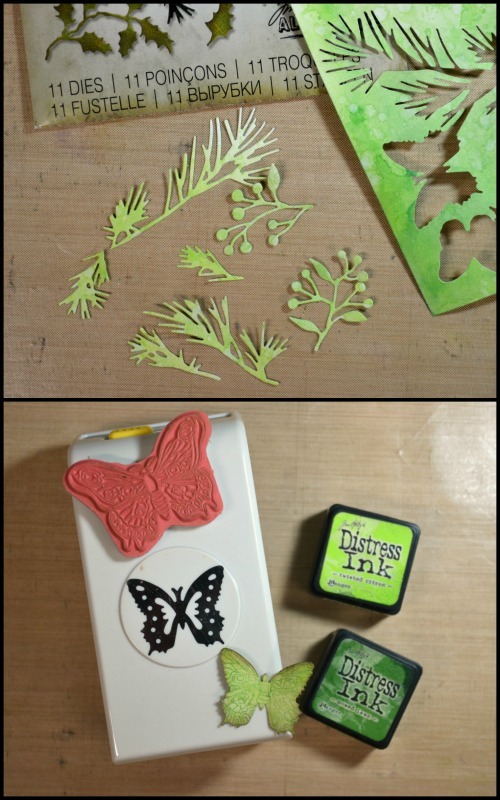 And using inspiration from our own Brenda Brown, I punched a butterfly from the same green cardstock with an EK Success punch and overstamped it with a Dina Wakley Scribbly Insects stamp (click here to read Brenda's butterfly tutorial). And then the wood panel was assembled. I adhered the Mini Holiday Greens around the bottom and glued the Alpha Dice in place with the little Salvaged Doll fairy princess perched on top of them. 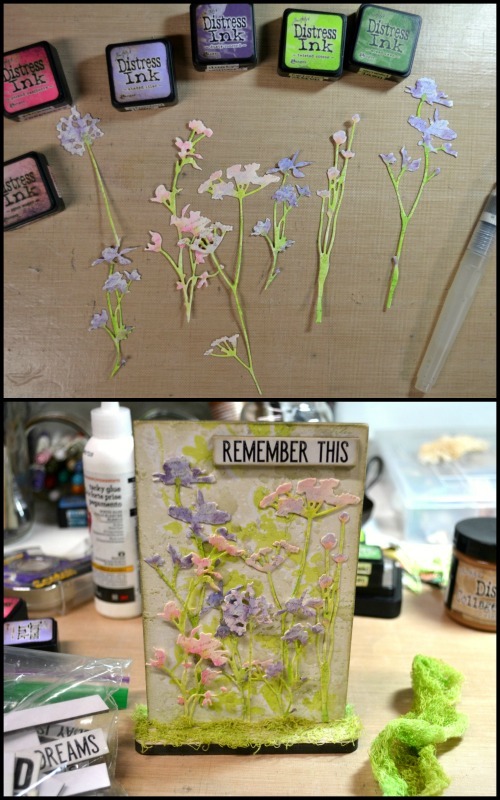 More flowers die cut with the Tiny Tattered Florals die, from card coloured with the same colours of pink and purple Distress inks as used on the Wildflowers, were adhered overtop of the greenery. That fabulous phrase from Tim's new Clippings Stickers was placed overtop of the popped up Wildflowers. I am finding those Clippings Stickers to be so inspiring, the stories you can tell with those wonderful words and phrases! And finally, the butterfly was perched onto the top of the panel as if about to take flight. 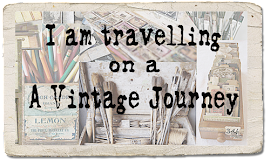 I hope that you've enjoyed seeing how my 'A Very Wonderful Place' altered wood panel came together, I had so much fun playing with the contents of the travel bag! 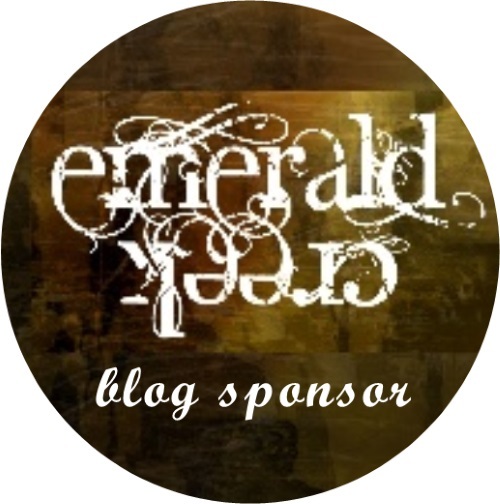 Be sure to stop by next Monday when Anne will be here with her Destination Inspiration project and I hope that you will also consider entering our current challenge, The Magic of Three. 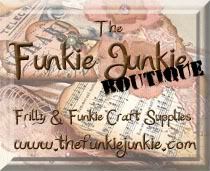 Thank you again for stopping by today and as always, happy creating! You always inspire with your pieces and this is no exception. What a delightful place to spend a warm spring-summer day. Will have to try your stencil mono printing. thanks as always for sharing. 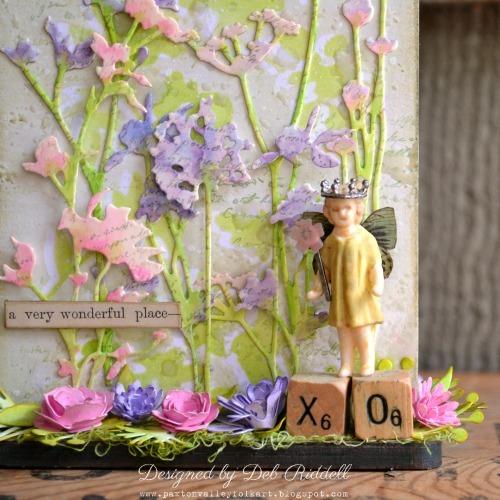 Deb, your springtime decor is soooo beautiful and inspirational! 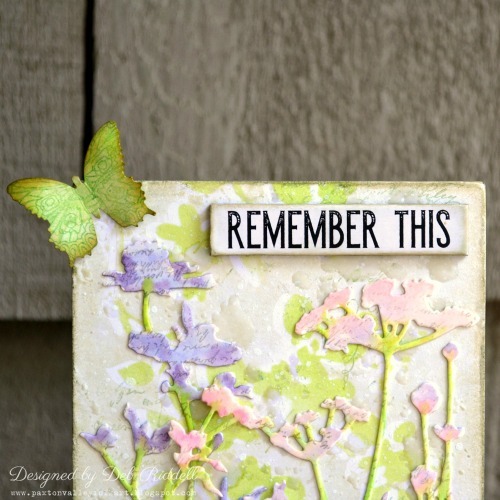 I love the background you made using the monoprint technique, and the dainty little flowers look amazing there layered on the background (love the script!) and then scattered on the base! So many sweet details to take in! Wonderful step out! Sooooo inspiring! Your rocked this! Hugs! What fantastic use of the travel bag contents Deb, the background looks amazing and the wild flowers look so beautifl in those gorgeous Spring colours! Your little winged fairy with her litttle crown is the perfect finishing touch! What a glorious springtime panel, Deb - all those delicately tinted wildflowers and the fabulous little fairy queen in charge of it all. Utterly delightful! This is gorgeous, love the background and step by step. What an absolutely gorgeous work of art! This is so spring and so beautiful! 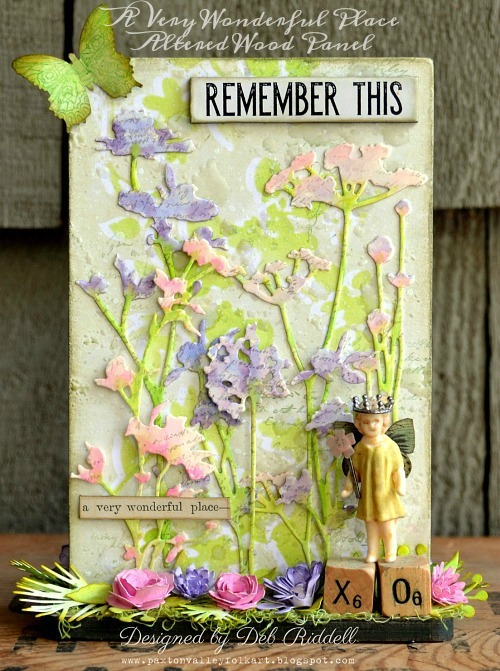 I just love the colors and elements you used to bring this piece together- brilliant!